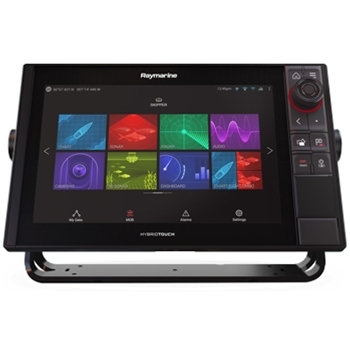 The Raymarine Axiom Pro 16 RVX with Navionics Plus Mapping offers a high performance, intuitive display and charting for all of North America. Enjoy quick processing and superb clarity. The AXIOM Pro offers a bright, high-resolution 16-inch LCD display with enhanced clarity. A polarized display allows for easy viewing in any environment. Engineered for offshore anglers and even commercial fisherman, the Axiom Pro is durable for any application. Offering the latest Lighthouse 3 OS with HybridTouch control gives anglers the flexibility of multi-touch interaction and rough weather keypad control. With a quad core processor, the Axiom Pro delivers blazing fast speeds and even the ability to run multiple apps without any lag in performance. With 16GB of internal memory you’re able to download 10,000 waypoints and up to 150 routes. Expand the memory of your AxiomPro with 2 SD card slots and even add detailed charting with the addition of optional charting. 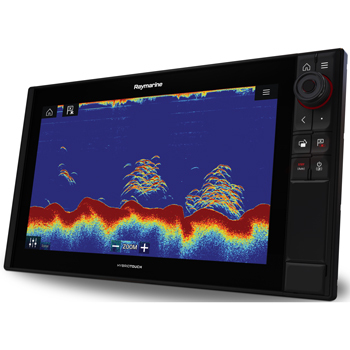 With Wi-Fi capability, you’re able to use a wide range of Raymarine apps with the Axiom. The Axiom Pro is packaged with Navionics + Charting for North America. The card includes detailed cruising, sailing and fishing information, port plans, safety depth contours, marine services, tides & currents, and navigation aids. The included Navionics HD Bathometric Sonar Charts show exceptional bottom contour and even include the sonar logs sent in by individual users for a more accurate sonar chart! 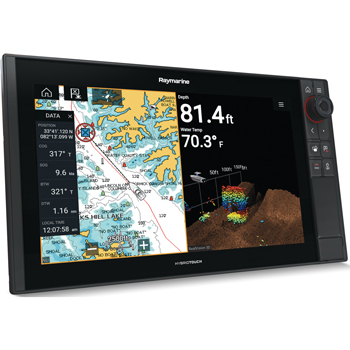 If the included chart doesn’t provide the detail you are looking for the Axiom Pro 16RVX is also Navionics Platinum Plus compatible for 4x higher resolution satellite photo overlay (the best available), full-view XGA panoramic pictures, improved 3D, and FREE high-definition fishing detail! With multiple sonar options the axiom will fit any application you throw at it. The Axiom’s 1kW single frequency CHIRP provides top of the line fishfinder abilities. Also, easily identify structure and locate fish with lifelike clarity of RealVision 3D sonar. The Axiom pro provides detailed SideVision & RealVision views up to 300ft., up to 600ft. with DownVision, and up to 900ft. with high frequency CHIRP. Black Box compatibility provides the option for a cp470 and cp570 allowing you a wide spectrum of bands for deep, Mid-range, and shallow fishing. The Axiom Pro is easily networked with other electronics to create an advanced navigation system that includes multiple Raymarine Axiom displays, Evolution autopilot, FLIR thermal night vision technology, Radar and more. Combine Axiom Pro with the FLIR M132 or M232 thermal camera and enjoy Clear Cruise™ IR Analytics. This Raymarine specific technology will automatically alert you to obstacles in your path creating a more relaxing and safe boating experience. With so many options available the Axiom Pro 16 RVX can accommodate any fisherman regardless of your needs! Each Raymarine Axiom Pro 16 RVX comes with: Axiom Pro 16RVX Display, Lighthouse Mapping, Raynet (F) to Raynet (F) 2 Meter Cable, Micro-C DeviceNet to STNG Cable (1M), Suncover, Panel Seal Gasket, Power/Video/NMEA 0183 Cable (1.5M), Mounting Hardware, Quick Start Guide, 3-Year Manufacturer’s Warranty.